in Google Groups is a great place to go to see people helping out their peers by asking for, and quickly sharing, best practices, references, advice, and observations. There are six discussion sections: Analytics Basics , Tracking Your Site , Your ROI, Troubleshooting, Urchin 5 Software, and Miscellaneous, each with a good number of interesting contributions. For example, in this helpful discussion thread user 'MercuryTide' asks, "Does anyone know if it is possible to have tracking report to 2 different GA accounts?" User 'ShoreTel' and user 'bac' reply that this can be accomplished by resetting the _uff flag, each giving a different method of doing so. And sometimes experienced users will answer a request for tips on more than just troubleshooting Google Analytics. In another discussion thread , user 'agapit' says, "I have just changed a site design and layout. I have not changed any marketing parameters. Bounce rate went down from 62% on home page to 49%. What proven design suggestions that lower Bounce Rates are there?" 'Caleb @ Pop,' an experienced Google Analytics Authorized Consultant, replies, "The most important thing to keeping bounce rate low is giving the visitor what they want to find right away." He goes on to give a helpful example of the path from ad click to conversion, citing that when possible, the landing pages should be customized to contain the converting action mentioned in the ad or link. And he recommends linking to a specific product page when advertising that product, rather than linking to the home page which would require some navigation by the visitor. 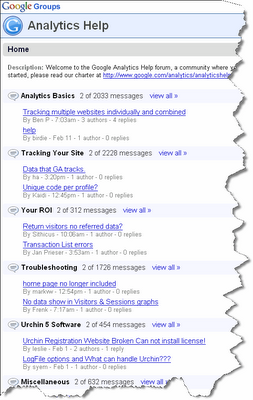 For lively discussion about Google Analytics, visit our Google Group. You can ask for answers to your questions, contribute your own knowledge, or just read through the different discussion threads to learn more. Have you ever needed some quick advice about using Google Analytics, or wanted to learn some cool tricks? The Analytics Help Forum in Google Groups is a great place to go to see people helping out their peers by asking for, and quickly sharing, best practices, references, advice, and observations.